Although carbon capture and storage (CCS) is acknowledged by experts as a key technology to fight climate change, it is currently stuck in second gear, writes Howard J. Herzog is Senior Research Engineer at Massachusetts Institute of Technology (MIT). The reason, he says, is that there is no market for CCS at this moment. He calls on policymakers to set a carbon price that would generate demand for CCS. There are many uncertainties with respect to global climate change, but there is one thing about which I have no doubts: we will not solve climate change by running out of fossil fuels. 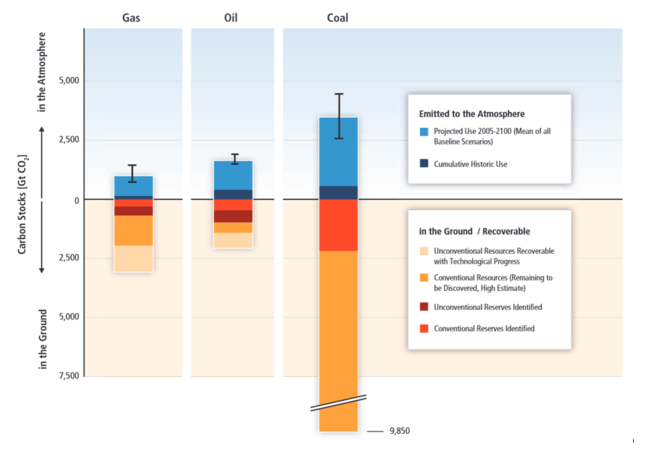 restrict fossil fuel use so that we leave most of our coal, oil and gas in the ground (see chart below). More than 85% of commercial energy today is supplied by fossil fuels. Given that there is no political will to increase the gasoline tax even by a nickel, do we have the political will to pass policy that will cause hundreds of trillions of dollars of assets to remain in the ground? find a technology that lets us use our fossil fuel reserves without emitting CO2 into the atmosphere. Such a technology exists today. It is called Carbon dioxide Capture and Storage, or CCS for short. To deploy CCS on the scale required is a monumental task. We need to store billions of tons of CO2 annually. However, this is the level of effort needed to address climate change. Similar efforts will be needed with other climate mitigation technologies, such as renewables, nuclear and efficiency. There is no silver bullet; we need them all. As of now, however, CCS is used very little, nowhere near the scale required to make a meaningful dent in emissions. Why? The reasons have less to do with technology maturity and more to do with government policies and the commercial incentives they create. storage, into deep geologic formations at depths greater than 800 meters (2,600 feet). All the necessary components of a CCS system are in commercial use today somewhere in the economy. To be considered commercial-grade, these different components need to be integrated and scaled up. In the US, there are CO2 pipeline networks with more than 4,000 miles of pipe. These pipelines were built primarily to bring CO2 from natural occurring wells to oil fields. In a practice known as enhanced oil recovery (EOR), CO2 gas is pumped into existing wells to force the release of more oil. About 50 million tons of CO2 per year are transported this way. Injection of CO2 and other gases into geological formations has been practiced for many years. As early as 1915, natural gas was stored underground. The first EOR operation injecting CO2 started in 1972. Acid gases (including CO2) have been stored in geologic formations since 1989, primarily in Canada. Several CCS demonstration projects, starting with Norway’s Sleipner in the North Sea in 1996, store CO2 at the million-ton-per-year scale. The first published paper referring to what would become CCS was in 1977. However, it was 15 years later that the field of CCS research achieved critical mass. In 1991, the International Energy Agency launched the Greenhouse Gas R&D Programme, also focusing on CCS. The US established its own research program at the Department of Energy in 1997, investing $1 million a year. That figure has since ballooned to more than $200 million a year today. In 2005, the Intergovernmental Panel on Climate Change (IPCC) released a Special Report on Carbon Dioxide Capture and Storage, confirming CCS’s position as a major climate mitigation option. By all measures, CCS grew dramatically from 1990 to 2009. One metric is the attendance at the premier international meetingon CCS (see graphic, below). Dozens of demonstration projects were announced. The research and development activities in laboratories and pilot plants exploded. New and improved solvents to capture CO2 from exhaust gases were developed. Processes that integrated power production and CO2 capture were designed, developed and tested. 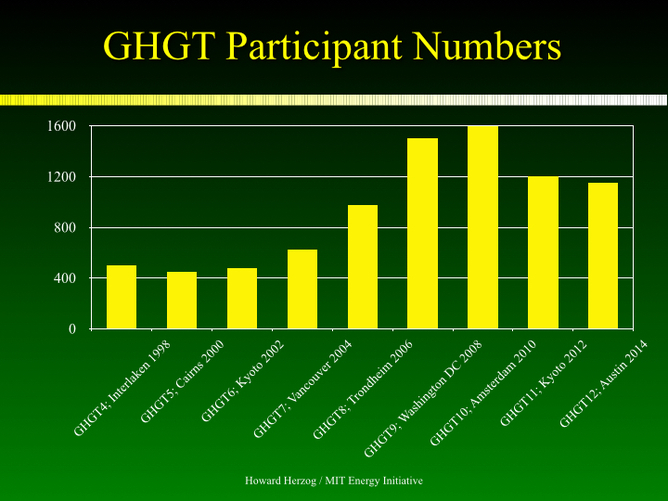 There were field tests for injecting CO2 underground, regulatory frameworks developed and public outreach programs. The vision was to have 20 large-scale demonstration projects on-line by 2020, at which time CCS could be considered commercial. In 2009, billions of dollars in stimulus money from the US and Europe were appropriated to help fund the vision. We were on the road to commercialization, but then we hit some potholes. In order for any technology to be commercial, there is a need to establish markets. Unlike other low-carbon technologies such as renewables and nuclear, CCS has only one purpose: to reduce CO2 emissions. 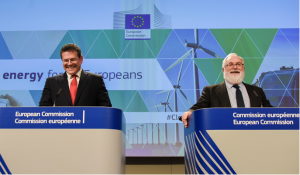 Therefore, markets will only be established by climate policy aimed at reducing greenhouse gas emissions to the atmosphere. In 2009, it looked like that policy was imminent. There were cap-and-trade bills in the US Congress. 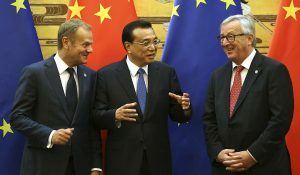 The Copenhagen climate meeting at the end of 2009 was expected to result in a new international protocol. Then it all fell apart. Climate policy became a partisan issue in the US, blocking any effective policy measures, and Copenhagen failed to achieve a protocol. 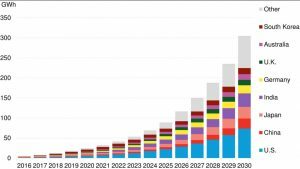 Markets that would have driven CCS forward have been put off for at least a decade, maybe longer. The participation of industry, such as electric utilities and oil companies, in developing CCS is crucial. However, as markets for the technology became more uncertain and pushed into the future, companies reexamined their commitment to CCS. And now the support level has dropped significantly, as nearer-term needs have taken priority. Government programs that grew at double-digit rates for many years have flattened out or, in some cases, declined. As a result, less than half of the 20 hoped for demonstrations will be on-line in 2020, and CCS commercialization will be pushed back at least until 2030. The latest IPCC Assessment Report on Mitigation mentioned CCS 35 times in the summary for policymakers. The International Energy Agency has repeatedly said CCS is a key technology for mitigating climate change. However, just as CCS is making great progress in building demonstration plants, developing new and improved technologies, and understanding and managing risks, the funding to carry on these activities at the level needed has begun to shrink. A short-term focus has replaced long-term strategies. This is a concern not just for people who consider CCS a critical technology, but should be worrisome for all who believe that mitigating climate change is a critical priority. We are not making the investments needed to meet a long-term goal of 80% reductions in CO2 emissions by mid century. I prefer to have an economy-wide carbon price to create markets for low-carbon technology. Then markets, not advocates, will make decisions about the technology mix. I believe deployment of CCS would be significant under such a policy. However, today we rely on government programs like fuel-efficiency standards for light-duty vehicles and renewable portfolio mandates for utilities to help reduce CO2 emissions. Economists generally agree that these programs are less effective and more costly than a carbon price for reducing CO2 emissions. If energy policies did focus on a long-term reduction of CO2, we would not see the slowdown in CCS we see today. Howard J. Herzog is Senior Research Engineer at Massachusetts Institute of Technology (MIT). He receives funding from Alstom Power, American Petroleum Institute, Chevron Corporation, ConocoPhillips, Duke Energy, Entergy, EPRI, ExxonMobil, Shell, Southern Company, Suncor, Vattenfall, BP, QRI, Technology Center Mongstad. This article was first published on The Conversation (originally entitled “Pumping CO2 underground can help fight climate change. Why is it stuck in second gear?”) and is republished here under a Creative Commons licence. Please note that in the UK the Energy Technologies Institute has just published a new report advocating a major CCS effort for the UK. See here. When I read these articles its like being back in 1962 & the Profumo trial in the UK and the Mandy Rice Davies comment “well he would say that wouldn’t he”. Missing from the panegyric is any mention whatsoever of costs – what does CCS cost? (per kWh). RES tech in the right place (there are a lot of them) is far cheaper than any fossil tech, abated or otherwise. Get the ETS functioning (i.e. place a price on CO2 which realistically values externalities and/or places a value on things such as “living on this planet with a reasonable climate”) and RES is made even more (financially) attractive compared to CCS-abated fossils. Competitor to CCS? 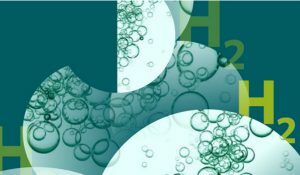 Synthetic methane from hydrogen produced by …. RES electricity. 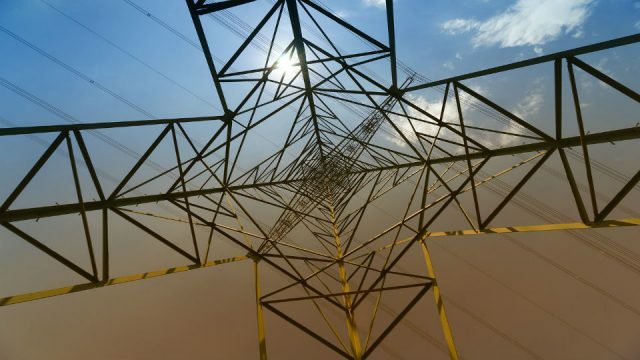 I agree with the statement: “To deploy CCS on the scale required is a monumental task” – well given RES is cheaper than new unabated fossil generation & given it has no need for lots of pipelines etc – why not just – go the RES route – quick, easy, cheap. Example numbers: lifetime kWhr Danish (new) off-shore – Euro51/MWh, (new) lignite Germany – Euro54/MWh (source: Prognos). I concluded the blog post as follows: “These are strong arguments for some attention to CCS R&D and demonstration, but, in my view, not at the expense of rapid development and deployment of renewables. This creates a conundrum as CCS demonstrations are expensive, and the money for them would have to come from somewhere. Government funding is at best problematic in current budget situations. Other possibilities are the fossil fuel industries themselves, which have a vested interest in continued purchase of their commodities. Countries with large reserves of fossil fuels – e.g., the U.S., with large reserves of coal – will also see value in CCS allowing extended use of secure domestic energy reserves. CCS is indeed stuck in second gear – and generally in reverse. Earlier assumptions on its deployment have been overtaken by altered realities. 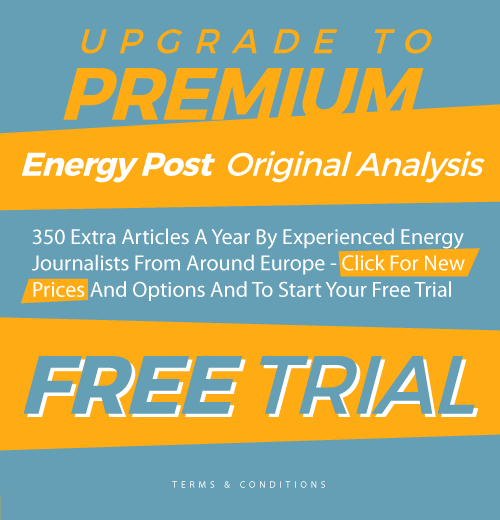 In 2008, the IEA had calculated that equipping almost 80% of all fossil power plants would account for 19% of the required CO2 savings for a global climate protection strategy. 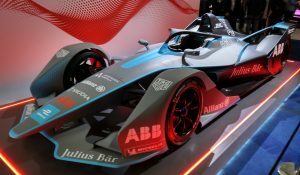 The timetable of the approach could be questioned, but it at least appeared more cost-effective than renewable energies. However, subsequent coal usage approaching 9 billion tonnes annually was not anticipated, nor were the accelerated cost reductions of renewable energies that have since ensued. Assumptions also diverge in North America, where CCS projects are generally dedicated to enhanced oil recovery. For these ventures, only the amount of CO2 is captured that can be sold to an oil field, resulting in carbon dioxide separation levels of typically below 60%. In the EU, by contrast, there is little oil to begin with. CO2 capture rates exceeding 90% are therefore advocated in the context of emissions trading. However, the increased penetration of renewable power on the grid compels coal power plants to be throttled repeatedly, releasing fewer emissions as a result. A CO2 pipeline network might therefore require backflow check valves for lack of continuous feeds. Perhaps the most crucial argument against CCS is that none of the North American projects approaches the scale of major European climate offenders with over 10 million tonnes of CO2 annually. Clean coal retrofits of these plants would be extremely expensive, while they could all be forced out of the market prematurely by the advent of new technologies. 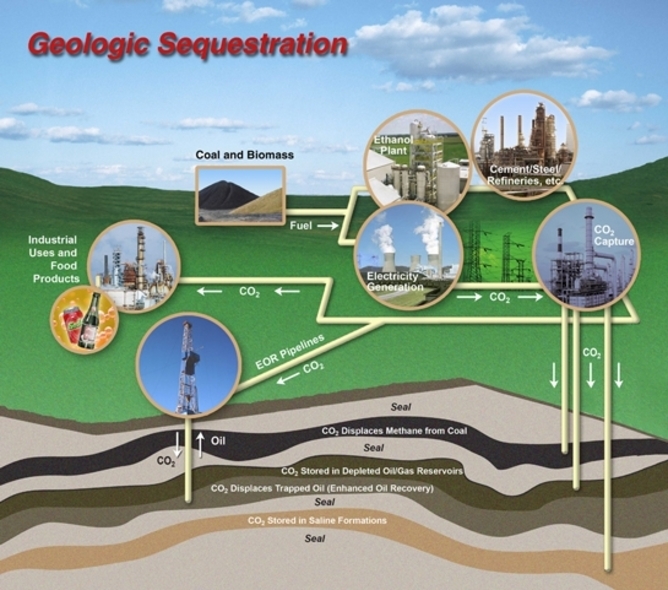 Carbon Capture Utilization is an alternate method to CCS. CCU Transforms the CO2 “on site”. No pipeline required. Cost is a fraction of CCS. Combusted exhaust, coal or natural gas is combusted energy that has not yet been given a purpose. Lets give it a purpose!